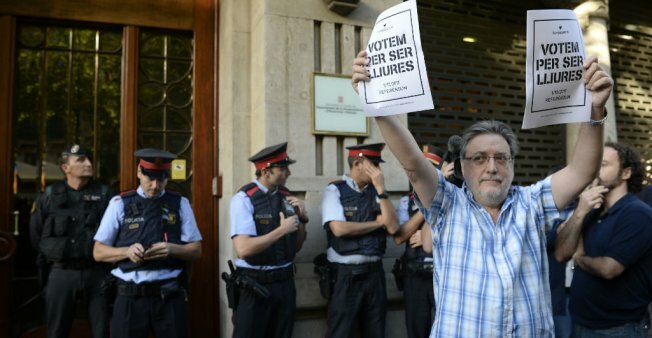 A man holds pro-referendum posters reading in Catalan "We vote to be free" as Spanish and Catalan police officers search officers of Catalonia's regional government in Barcelona on September 20, 2017. Spain's Guardia Civil police force on Wednesday arrested the Catalan vice-president's right-hand man, police and Catalonia's regional government said. The arrest of Josep Maria Jove, the secretary general of the Catalan vice-presidency, comes amid mounting tensions over Catalonia's plans to hold an independence referendum on October 1 deemed illegal by Madrid. The Guardia Civil searched several regional government headquarters in Barcelona, a Catalan government spokesman said.